LAHORE (92 News) – The opposition parties strongly protested against the Orange Line Train project on Tuesday. 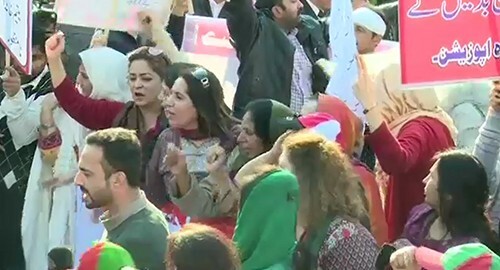 Workers of different opposition parties gathered on the Mall Road, GPO Chowk and chanted slogans against the project. PTI chairman Imran Khan announced to protest against the project on February 6. He said that the project was being carried out through a loan of Rs 200 billion. “The government has imposed taxes under the anti-people policy,” he said.